The Hybrid-Air is the Worlds 1st Dual purpose Plug & Play Seaplane Rc Aircraft. 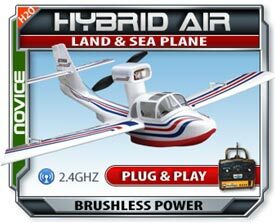 Able to take-off from water and land make the Hybrid-Air both versatile and fun. Powered by a powerful Brushless outrunner motor and Li-Poly battery (RTF&ARTF only) pack gives the power you need to take off almost any surface and fly in any environment. The included landing gear simply plugs into the bottom of the plane with no tools needed. When you want to take-off from water simply remove landing gear. The included 1800 mah battery can give you up to 16 minutes of flight time. Hybrid-Air has a fully proportional 4 channel 2.4GHZ radio system (RTF only) that allow for loops, rolls, inverted flight and more. The Included 2.4GHZ radio (RTF only) has a range of 4000 feet for long distance flight.